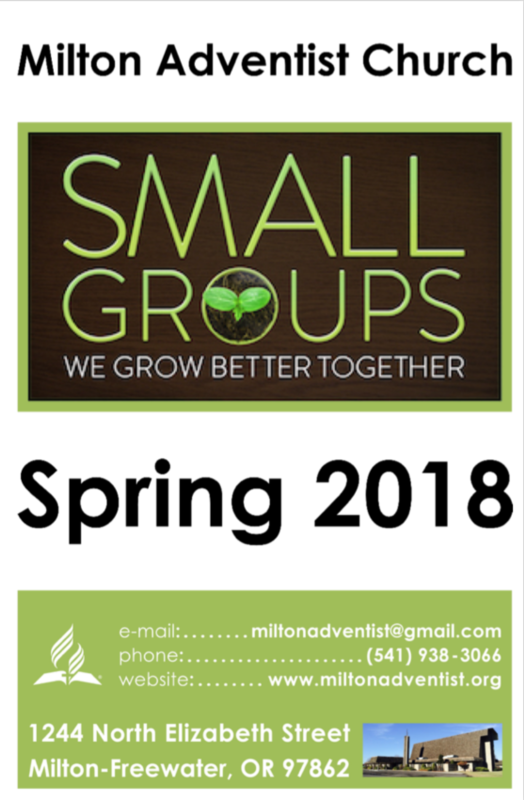 Small Groups are Happening Now! Description: What does it mean to be baptized by the Holy Spirit? This weekly fellowship class will answer the following questions: Does it happen at water baptism or at another time? What are the two purposes of being baptized by the Holy Spirit? How do we avoid fanaticism yet allow the Holy Spirit to work in us and through us? What will be the effect on the church if a majority of members are filled with the Holy Spirit? Description: Come learn about the 18 essential oils used in Bible times, as well as: how essential oils are used today as complimentary medicine, the pharmacological make-up and benefits of oils, and the methods utilized by clinical aromatherapists. Clinical Aromatherapists responsibilities include: Undertaking patient consultations; identifying appropriate essential oils; planning and explaining treatment requirements; liaising with physicians, making referrals to specialists and other health care practitioners, and much more. Description: This class is for non-medical people who want to be prepared to possibly save a life. You’ll learn how to identify whether or not someone needs CPR, how to administer compression, and the steps needed to assist someone who is down. Description: Would you like to eat healthier but aren’t sure how to get started? Come join us for two nights of exploring simple changes, demonstrating delicious recipes, and sampling the results. Description: Biblically based solutions on handling money and possessions. Through DVD, workbooks, and group discussion, topics include: How do I deal with Financial Stress? What’s My Responsibility Toward Debt? How do I Tithe a Business or Rental? These and many more of your financial questions will be answered. Description: Always wanted a garden but don’t know how to get started? Already a gardener but want to have a better garden? Just want to hang out with people who love to garden? We will be covering topics such as: benefits of gardening, soil preparation, starting plants from seed and propagation, garden plot—where to plant what and companion planting, weed and insect control, harvest, storage, and preserving. Description: Come and discover some of Jesus’ greatest teachings. We don’t need to wonder what “truth” is in today’s world. The Bible makes it very clear. We will search for truth together and discuss the treasures that we find. Description: No one should have to feel alone in his or her grief. If you’re looking for support and understanding, this group can help. Using the book, Understanding Your Grief by Dr. Alan Wolfelt, this 10-week course will help you as your work through the process of losing a loved one. Description: According to the American Diabetes Association, 1.5 million Americans are diagnosed with diabetes every year. If you are one of the statistics, don’t lose heart! With the right and very doable lifestyle changes, diabetes can be reversed. Come and find out how! Description: Bring one dull kitchen knife or pocketknife to the first class and learn the basics of blade sharpening. The second class will cover hatchets and lawn mower blades, so bring a dull hatchet or lawn blade. Be sure to secure your chance to learn some practical skills to keep your tools in sharp shape and ready for your projects. Class is limited to 15 participants. Description: Each week the focus will be on one of these Seven Essential Daily Prayers: Purity in My Mind; Righteousness in My Heart; Integrity in My Life; Joy in My Spirit; Strength for My Body; Wisdom for My Counsel; To be a Godly Influence in the World. The class material will be presented using PowerPoint illustrations, and opportunities for open questions, comments, and dialog with each participant. Description: Come and enjoy a lively round table discussion on the challenges and blessings of parenting. There will also be some evening snacks and a brief introduction to the upcoming “Art of Parenting” weekend.